It is Christmas eve 2013 and I find myself thinking of snow. Probably I would like anything to divert my attention from the howling wind outside, the flicking electricity, the stone hard hail that keeps rattling the windows and the permanent leak we have in the corridor for the last 10 days! I am not complaining, I am just explaining, how it is... Well, maybe just looking for sympathy, because I don't like the wind at all. The autumn and the winter were so fine this year - mild and not too cold, no extreme weather. We had some great walks and I took some fab photos from Connemara's gorgeous bog lands and hills. But for the last 10 days we entered a permanent storm, it hasn't eased up for a second! We live here at the foothills of the mountains and the weather is always a bit more extreme and a bit colder than anywhere else in the area. But this crazy storm, I haven't seen anything like it before! Even right now, while I write to you, the wind is howling into the chimneys and surrounding the house with the best surround sound you can get!! At least it is not hailing, but hey! I am sure it will start in a moment!! 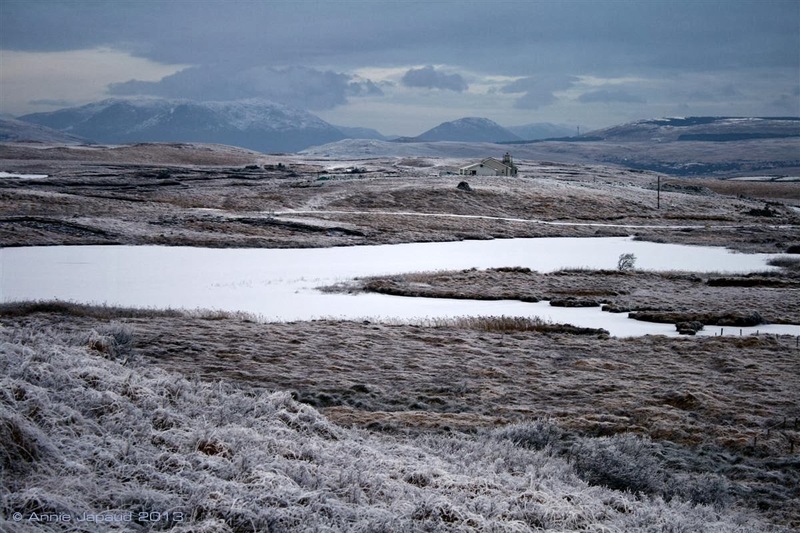 So, in defiance of this crazy weather, I will post some peaceful Connemara images from a few years back when the mountains were covered with a thin layer of beautiful fluffy snow that didn't last long but transformed the place into a magical land! Enjoy and think of peace, calm thought and happiness!! Click on the images to view as a slideshow!